Got an email from from Kevin Carter, Special Events Coordinator for Harrah's Rincon Casino. He is inviting all Swamis to feel free to park at the Casino and ride to the KOM. He will be sending me around 100 "Rack Cards" that will have a food coupon on the bottom. So if you get stuck on Palomar and cannot make "Party Swami" make sure you get your Harrah's coupon from me in early February. Use this to help determine how to see as much of the race as you think you can. Here is the official street closure info for Stage 8. Keep this official link to get any changes. Grand Avenue from Maple to Kalmia; Maple & Kalmia between Valley Parkway & 2nd Avenue will be closed from 6 a.m. Saturday, February 21, to 5 a.m. Monday, February 23. Broadway between 2nd Avenue & Valley Parkway will be closed from 8 p.m. Saturday, February 21, to 12 a.m. Monday, February 23. Grand Avenue between Escondido Boulevard & Juniper; Grand Avenue cross streets between Valley Parkway to 2nd Avenue will be closed from 8 a.m. Sunday, February 22, to 5 a.m. Monday, February 23. 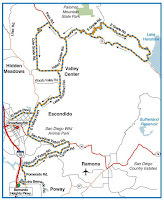 & East Valley Parkway Noon–1:15 p.m.
& Lake Wohlford Road 12:15 p.m.–1:15 p.m.
& El Norte Parkway 2:30 p.m.–4:30 p.m.
& Escondido Boulevard 3:00 p.m.–4:45 p.m.